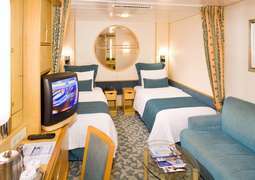 Make yourself at home on Navigator of the Seas! With a tagline like "Your Home While You Roam," a Navigator of the Seas cruise will surely offer you the utmost in comfort. From stem to stern, this family-friendly ship is packed with games, shopping, athletic pursuits, and water adventures, keeping your entire family entertained, challenged, and looking forward to what's next. Take a break from all of the fun and enjoy Navigator of the Seas' vast food choices, which offer something to appeal to even the most discriminating of tastes. With so many delicious delights and fascinating possibilities on board, you may forget that you're headed to a remarkable location. Whether you're a thrill-seeker hoping for an Alaskan wilderness adventure, a beach bum seeking fun in the Caribbean or Bahamian sun, or a history buff looking to visit the highlights of European antiquity, Royal Caribbean has designed a Navigator of the Seas voyage with you in mind. 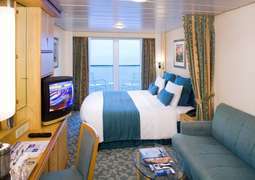 All of Navigator of the Seas' staterooms were designed to provide passengers with the highest level of comfort. Interior and oceanview rooms give you the peaceful release you'll need after a funfilled day of sightseeing. You'll be blown away by the service and amenities available. 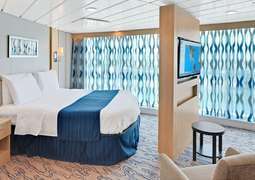 Offering all of the conveniences of home such as Wi-Fi access and a crib for your youngest travel companions, and things that you could never get at home such as 24-hour room service and nightly turndown service, this ship and its crew ensure an exquisite escape. Amid an impressive collection of culinary offerings, such as Izumi's Japanese delights, and Sabor's fresh and modern take on Mexican classics, the Chef's Table Dining Package is a stand-out, must-have experience for gourmands sailing on Navigator of the Seas. Available for dinner only and with limited reservations, the package enchants diners with a five-course culinary escapade prepared by the ship's chef de cuisine. They say you can't please everybody – Royal Caribbean says otherwise. Navigator of the Seas' list of activities is guaranteed to please everybody. You may want to learn the latest steps from a professional dance instructor, test your surfing aptitude with a go on FlowRider, a 40-foot long surf simulator, or tackle your fears by scaling a rock wall to get a bird's eye view of the ship. Of course, if you prefer to improve your relaxation skills, you can claim a poolside lounge chair at the adults-only solarium and enjoy the peace of this indoor/outdoor sanctuary. Other than at some dining outlets, which require smart casual attire, and Chef's Table dining experiences, where formal attire is expected, casual resort attire is acceptable in all areas of Navigator of the Seas.